This is an idea I have had for a long time and I finally designed one. The results are excellent. The amp uses a surface mount car stereo power amp IC and can produce 25 to 30 watts with a 16V-18V supply into a 4 ohm speaker. The circuit fits in a 1590bb enclosure and has Reverb, Bass, Treble and Gain controls. The tonal response is tailored for guitar in the OP amp stages, along with the James/Baxandall tone stack. The James/Baxandall is a versatile choice because it provides boost and cut. I find it a better choice then the “beef stew” fender tone stacks. Reverb is provided by means of an FV1 DSP IC. It can be omitted easily if desired. The Power amp IC is bonded to the case to provide heat sinking when it is cranked up. I used a piece of 1/2 inch copper pipe -reshaped to be the heat sink. As I have done with some of my earlier amplifiers, I have employed negative feedback from the speaker back to a discrete stage driving the final amplifier. This is a common practice in tube amps to flatten the tonal response of the output transformers and so it is unconventional to apply it here. I find it affects the over all sound in a pleasing manner. The amount of feedback is small and could be increased or removed (this will affect the bias of the JFET Q3) All of the signal chains are low impedance (except the input) and gain distribution is such that the amplifier is very low noise. The amp powers up when the input is plugged in. The output is not ground referenced so the output jack is isolated from the case -(which is grounded via the heat sink). All you need is a tool battery or 12-18V power supply and a speaker cabinet and you can blast away. The mosfets used for polarity protection and power switching are just high current PMOS devices and not special – lots of other devices will work here. 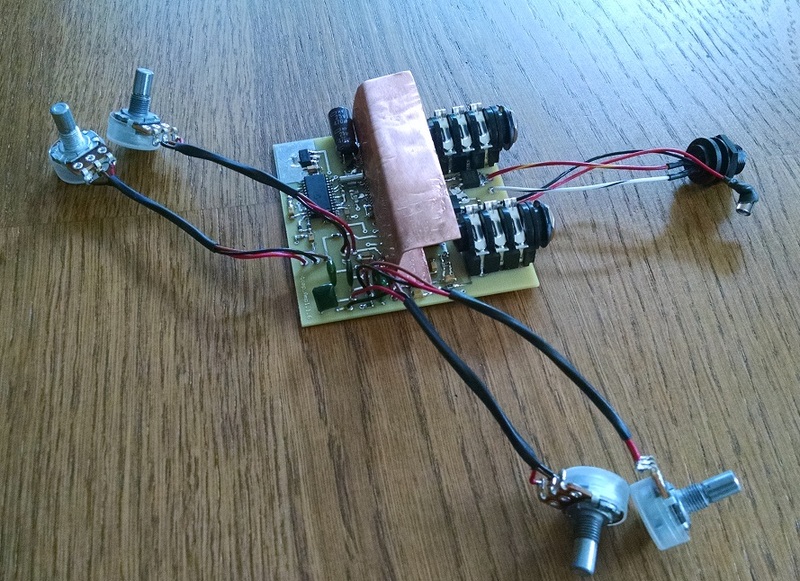 The op amp is a low noise type with a wide supply voltage range – others will work here also. Hi,I just wanted to thank you for this cool little tool thst now resides on my pedal board.Great sound,not overly compressed or dull sounding like most solid state amps.It reminds me a lot of my gigging amp,a ’68 Princeton Reverb.I let a bassist friend of mine play through it,he loved it too.Built well too,the first time I plugged it in I tripped over the cable and fell on on a concrete floor.Still works perfectly and didn’t even sustain a scratch! I noticed your a jazz player…. I designed the thing with my archtop in mind. I like to busk some and use it with a 8 inch speaker in a small cabinet. I like to play a lot of drop two chords and inversions (on the bass strings) and with heavy flatwounds and the massive neck pickup – they can sound muddy. I was able to get a good sound with this design. Probably need to put in a switch for when using a Bass. The super low end gets cut some – because I wanted to tailor for guitar – easy fix. If you ever have trouble with it let me know .. I am local and happy to repair it if anything goes wrong- you shouldn’t have any problems. I would love to have the Stomp Amp, but I would need a 1/4″ line out to go to a mixer board. Is that something that could be added? I’m playing a gig with Randy tonight.Will the speaker out work as a line level out into a Mackie mixer? No that won’t work well. The output is not ground referenced and the amp is designed to work under speaker load. I would mike a speaker. If this is going to be a common requirement for you… I can mod your unit to have a line out – with or without a speaker. Let me work on it for a few days and I will get back to you. If you don’t want to modify with a jack – we can make a line out / speaker cable adapter. Randy just needs the pre amp section of your pedal.He takes a Cube to his gig,but I didn’t realize he muted the speaker and was only going through the PA.
Next time you are at Sherwood’s go check out my reverb pedal the “kool-verb”. This is a more advanced version of the reverb design in the stomp amp. 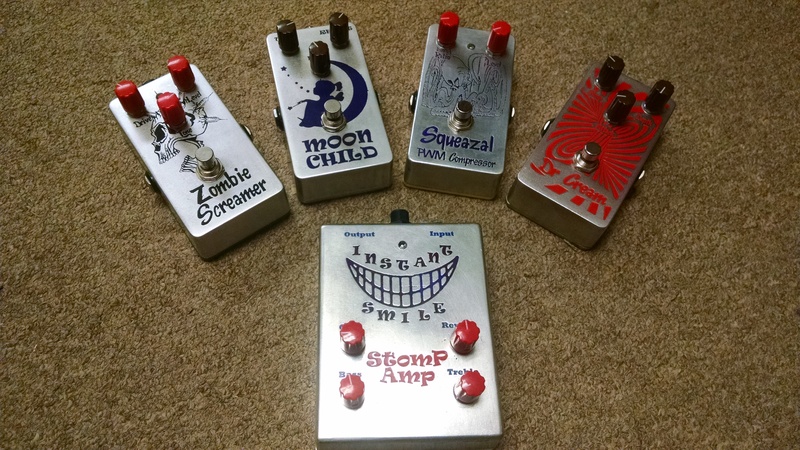 What I am going to do is create a pre-amp pedal that has the more advance reverb, balanced line out, unbalanced line out, and tonal control, plus a couple of tone peaking switches. That would probably work well for Randy.BTW,I also used the Stomp Amp last night on my hotel gig with my B3 trio.It covered all the bases and had a nice clear,revealing sound for my archtop.Flatwounds really sound nice through it,even my cleanest Fender amps still muddy the bass up a bit compared to your pedal. That’s so great. Most non jazz players don’t get it. A full balanced clean tone is required for jazz and frankly its not that easy to get. Most of it is the instrument and playing but so many amps are designed to sound good primarily distorted or highly ‘effected” and they just don’t sound good with an archtop or even an electric guitar set up for jazz. Acoustic amps are not a good choice either because they are designed to bring out all of the overtones with round wound strings and the overtone generation of the non floating bridge. They sound shrill. lots of great amps that do work well – don’t get me wrong but non of them are cheap! You probably saw in my demo video I was using an old drill battery to power the amp. I have had to play weddings outside..etc and being able to play with a battery is nice. If you ever need to do that – you can get a battery pack cooked up easily – let me know if that ever becomes a requirement and you need technical assistance. Effects sound better with your amp too,especially echo and other time based gadgets.Overdrive pedals still sound warm and non-buzzy. great project, i was looking for something like that, i would like to experiment with overdrive sound , clean is amazing, good job, thanx a lot to share this. God bless you man. I have a layout …it was done with expresspcb- it uses surface mount components. Because of this I have not posted the files – its also a two layer board. Having said all of this – do you still want it? hello, sure i would like to see the pcb and i would like to realize one of this also, i think will a little problem with two faces pcb, never used it before, but i could try, it is for a right cause! Anyway, i thank you for your courtesy.